There is a big difference between talking about values and embodying the values we talk about in order to transform unworkable realities. Similarly, there is a difference between ‘teaching’ universal values and ‘embodying’ them. We will discuss the profound humility of BEING open, self-aware, in practice, on a path of life-long learning for everyone, including academicians and others who excel in the subject matter of what they teach. In our workplaces, including academia, we often let our differences rule us rather than our individual and collective greatness. Sourcing our universal values truly binds us deeply — our inner capacities and universal values is one place where all can connect. This enhances respect for each other and diversity, shaping the way we think and what we do. We will explore how teaching in higher education institutions can apply the conscious full-spectrum approach to enhance theoretical courses as well as field work. Students learn how to design strategies based on universal values such as dignity, equity and compassion in order to make the invisible and subtle patterns of stigma and discrimination, visible; they can make complex systems simple for the service users; they can design initiatives for change. Making this way of learning- and-serving the norm generates measurable change. Fallacy: Planning templates cannot be used for the many complex problems we face. These methods (e.g. CFSR approach) are for projects. Social norms leading to stigma and discrimination, workplace environments that are difficult, academic spheres such as teaching, require very different approaches. New Learning: The conscious full-spectrum response is robust and profound. Though the praxis, sourcing universal values for action to shift disempowering patterns need to be constantly applied in various settings and for solving different problems. Bio: Srilatha Juvva is a social work educator with a Ph.D. in Psychiatric Social Work. She is currently Professor with the Centre for Disability Studies and Action, School of Social Work, Tata Institute of Social Sciences, Mumbai, India. She has over 24 years of teaching and clinical practice experience. She cares deeply about manifesting full potential and fairness in self and others. Her areas of expertise include mental health, disability, disaster mental health, and therapeutic interventions. She uses the transformative design templates in theoretical classes as well as field work and practice with students and NGOs. She serves on the Board of several NGOs and Academic Board of Studies in 5 universities. 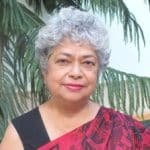 Professor Srilatha Juvva has directed many research projects and has published in peer reviewed national and international journals and in books. She was a Fulbright Senior Research Fellow. She is an enthusiastic volunteer in disaster situations, with expertise in rendering services and building capacity in psychosocial care. She is a member of professional associations in the field of Social Work. Srilatha Juvva is a practitioner-coach and uses the transformative templates and tools in her everyday practice, both in her personal and professional life in order to foster radical transformational leaders and students.